With an ocean of articles covering these subjects, I'm skipping ahead to an aspect of bilge pump selection less commonly addressed: choosing a bilge pump system and component type that's most ideal for your boating routines and needs, primarily dealing with automatic versus manual bilge pumps, and the switch options and variations to control the pumps. 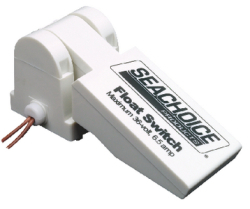 Float-switch: mounts to the bottom of the bilge, which works much like any other float-switch; when water levels increase, the float is raised, which activates the the pump. Manual Bilge pumps that utilize float-switches become automated, and are commonly referred to as "automatic bilge pumps"
Bilge pump switch (non-float): mounts to the dash. Depending on the switch, you'll have the option of “on/off” or “Auto/Manual/Off”. "Manual" or "On" will be for when you want the pump on, regardless of water level readings by the pump (or float-switch). Auto will activate the functionality of the float-switch or built in sensor, allowing the bilge-water removal process to be automated. 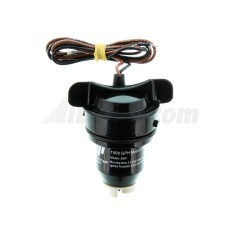 Automatic Bilge Pump: have built-in water sensors that periodically turn on to check for water. If water is present, the pump will activate. The sensor will usually turn on once every few minutes. The advantage of automatic pumps is that you get an automated water evacuation system without requiring any components other than the pump and wiring hardware to connect to the electrical system, which is simple and takes up minimal space. 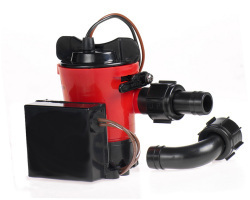 The biggest disadvantages of an automatic bilge pump, assuming it's not connected to a switch, is that if the pump is not disconnected from the battery, it's sensor will continue to periodically activate. If you store your boat outside of the water, this feature becomes pointless and will slowly drain your battery. The second disadvantage is the lack of manual on/off control, though there are some exceptions. 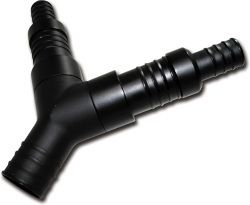 Manual Bilge Pump: activated by either a float-switch or a (dash mounted) bilge pump switch. 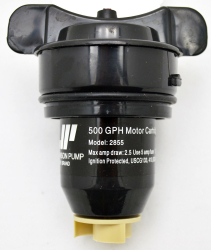 If a float-switch is used, the pump becomes an “automatic” bilge pump, but rather uses a float-switch to activate the pump rather than the water sensor. It's common for manual pumps to be sold with float switches and be labeled as as “Automatic”. If you have a system consisting of manual bilge pump, float-switch, and bilge pump switch, you'll have full control of how and when the pump activates. The auto feature will use the float-switch to activate the pump, with on/off turning the pump on/off regardless of float-switch readings. Manual bilge pump with 3 way pump switch and float-switch: complete control of your pump including choice of automated water evacuation. 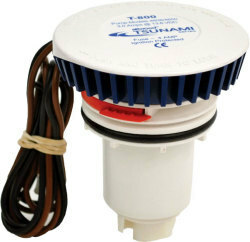 Manual bilge pump with float-switch: becomes automatic, but doesn't allow for direct on/off control. Automatic Bilge pump with 2 or 3 way pump switch: ability to turn it completely off. Some Automatic pumps give the ability to manually turn the pump on, which would have the same results as a manual bilge pump system that uses both a float-switch and a bilge pump switch. Automatic Bilge Pump with no switches: ability to manually turn on or off (some exceptions) and will drain battery if not disconnected. Relatively speaking to the rest of boating, pumps and components are exceptionally inexpensive, making not "cheaping-out" almost painless. If you're in the market, we carry bilge pumps from Rule, Johnson, Attwood and SeaSense who all offer a wide variety of top quality pumps, cartridges and switches. Addionally, with the iboats.com Low Price Guarantee, you can be sure to get the very best price available. I’m Jeff Lander. And I’m Mike Irvine. And today we are going to talk about Rule bilge pumps and avoiding dips and sags in your discharge hose line. Now the big thing is, when you install your Rule bilge pump, has to go continuously upward. That discharge line if it has any sags in it, it is going to cause a water trap. We made you a cool fixture to show you what is going on. So this is pretty cool. We have some clear pvc, hooked up to a 500 gallon per hour pump. We made it so we can raise and lower the pump to simulate the water level dropping in the bilge. So as the water level goes down, the lower switch shuts the pump off, and residual water in the line drains back down into the system. So what happens is, some of the water remains in this little valley here. And there’s a whole bunch of air that goes from here, all the over to the other side of the pump. Actually to the underside of the impeller cavity. Now as the water level raises again, you still have this air bubble that goes from here and up and over to just about there where that water level is. Pump switch turns on, it can’t pump the water, and that’s because these pumps are centrifugal style pumps. They are not self-priming. Which means the water has to be in contact with the impeller to be able to pump the water out. That’s a great example of an air lock right there. See that big air bubble on the underside of that running pump? That air cannot move through the system because of that air trap right there. That water is stuck and can’t move through the system of that valley. Gravity is pulling the water down to the bottom of that valley there. And this air can’t go any place. So the pump is running, but it just can’t displace that air. So there you have it. We just showed you what happens when your Rule pump has dips and sags in the discharge hose line. Now the big takeaway is to run that discharge line continuously upward. If you have any valleys, that is where the water is going to collect, and that could cause an air lock. Well, I’m Mike Irvine and I’m Jeff Lander. Thanks for tuning into this episode of Jabsco Tech. Hopefully it was helpful to see what can happen when there are dips and sags in your discharge hose line. Come back soon, we’ll have more videos for you. [Mark] Hi we’re here at the Safety At Sea seminar in Annapolis Maryland and we’re at the swimming pool doing some hands-on demonstrations today taking a look at manual bilge pumps. Every boat should have one and we’re giving people a chance to see how much effort and time it takes to move a given amount of water. The whole idea here is to be self-sufficient and get the boat home and not lose it at sea and with the right tools can get the job done. Will kind of talk a little bit about pumps in general? What’s the philosophy with them? [Will] The philosophy of a bilge pumps is to be able to generate the capacity needed to deal with any water ingress into your boat. The first thing you need to do is understand how much capacity you have for your electric pump and for your manual pump. [Mark] So I guess the first thing you want to do so is you want to find the leak and stop it right? [Will} Exactly, you want to make sure you get your electric bilge pumps going and then you go and look for a point of ingress, that’s the most important thing. And if you can’t stop it slow it down. So that you get a point with knowing that your pump can handle what’s coming in. Now there are some that would like to say well if your boat is 40 feet, this is what your pumping capacity has to be. I’m a big believer that instead of regulation I think you have got to take personal responsibility. You know where you’re going to go with the boat. If you’re in a remote area then you need to be a lot more self-sufficient. If you’re in the middle of Buzzards Bay maybe perhaps a little bit less so. It’s manageable and it’s doable and certainly pumps have saved a lot of boats. But the key is being prepared, having through-hull plugs and having a way to plug a rudder-post hole, making sure that you stay up with the manufacturer’s recommendations on replacing the sail drive bladder. I mean those things are all critically important. We sell these pumps that we are demoing today, we have it mounted on a boar. They are portable pumps; they could be handed to another boat in distress because they may not be a problem on your boat. It may be the boat next door in an anchorage that all of a sudden has a water issue and you need to get pumping over to them. [Mark] Talk a little about the conditions and what you need to think about. [Will] The placement of the pump if permanently installed should be done in a way that you can brace yourself in a seaway so you can get your body behind the pumping motion. Because then you have a greater sustainability rate of pumping action and that’s really critical. Water is heavy, you got to move it and it takes a certain amount of energy to do it. [Mark] Some of the takeaways I think that we have come up with is that you can’t have a pump that too big. When you need it, you need it and when you need to move water out of your boat you need to move quickly. A bilge pump alarm is going to let you know that you have a problem. You have got to get down there; you have got to find your leak. You’re going to plug that or stem the floor a little bit to get it to the point where you can keep up with it with your pump if you want to get home without calling the Coast Guard. Submersible bilge pumps are a necessity for almost every boat. 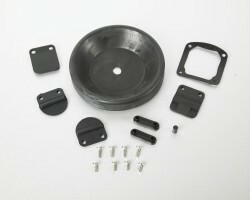 At iboats.com offers a massive range of bilge pump models from brands such as Rule, Johnson, Attwood, SeaSense, Seachoice, and Jabsco. Choose from a wide selection of GPH ratings (gallon per hour), outlet sizes, voltages, and choice between Automatic pump vs. manual pump, or cartridge vs. non-cartridge. 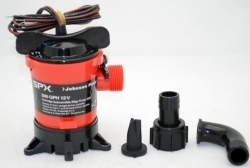 Are you looking to make that manual bilge pump automatic? No problem, we have a wide selection of floats and switches that give you the ability to choose how and when you want your bilge pump to activate, as well as replacement cartridges to keep your pump working smoothly.